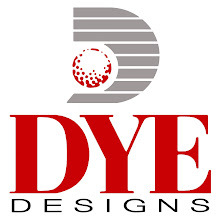 The Home of Dye Golf Worldwide. Dye Announces The Crook Point Resort in Oregon! 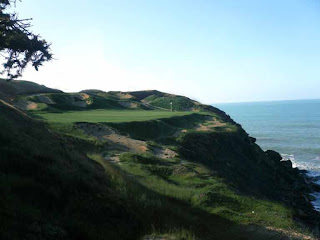 Located on the Pacific coast, halfway between the coastal communities of Brookings and Gold Beach, dreams of a spectacular new golf resort - The Crook Point Resort Golf Club - are quickly becoming reality. This scenic stretch of the coastline is already considered one of the premier golf and fishing destinations in the United States. And now, with a new 18-hole, Dye-designed golf course on the horizon, the natural appeal of Oregon's coast is about to reach new heights with spectacular ocean views leading the way. be designed by Perry Dye. "This is the kind of site a golf architect dreams about. We have the opportunity to take advantage of the beautiful Oregon coast by routing our design along the shoreline and up on the cliff vistas." says Perry Dye. "The dramatic landscape and gorgeous views will give this course a uniquely natural feel. I am excited for what Crook Point will surely become- one of the most sought after tee times on the west coast." VIP membership packages are available for a limited time- space is limited. Please click here for details. Should be ready for play soon! Dye Designs: Full Speed Ahead in Roatan! Despite recent political turmoil in Honduras, The Black Pearl remains under construction and things remain normal on the island of Roatan. “When countries go into funks like this, things slow down -- fuel comes in slowly, parts for bulldozers come in slowly. It's sometimes aggravating, but working on an island in a foreign country, you learn to expect it. 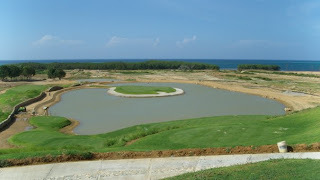 We are focused on building the golf course and creating a vibrant community that helps to enhance tourism to Roatan.” Says Perry Dye who is heading up the project. The #11 island green at The Black Pearl has taken shape and was seeded with sprigs of Paspalum, a salt-tolerant grass that allows watering with brackish water- a major environmental plus for the project. This will also allow the course to focus on water management to be as low impact as possible. The island boasts the world’s second largest Barrier reef, and is already a must-visit for avid divers. With the addition of a world class Pete and Perry Dye golf course and a five star resort, Roatan is sure to become the premier vacation destination in the Caribbean. For more information about the Black Pearl at Pristine Bay, please contact lucy@dyedesigns.com. Rally for the Cure®, is about women and men who are committed to making a difference in the fight against breast cancer. The success of this breast cancer awareness program only happens when people are willing to take on the challenge. We played in and sponsored a Rally tournament in Colorado last week. What a pleasure to see so many women participate! The event was so much fun, and it is always such a privilege to work with the Susan G. Komen foundation. Golf does so much for charity!!! Ponte Vedra Beach, FL- Although this year it will host one of the strongest fields in golf, at TPC Sawgrass the star is the golf course. The list of champions here is impressive- Tiger, Phil, Sergio, Norman- but what everyone remebers about this course is the 17th hole. The infamous island green. Pete says: "On the 17th we dug and we dug and started to shape a big deep lake. There was really no way we could put in dry land. My wife Alice said "why don't we bulkhead the middle and build an island green?" I said "we'll probably get killed, but let's do it." So we piled up some dirt, capped it with sand and bulkheaded it to keep it together and built a green on top." The course was designed for this tournament and has always provided a challenge to the players. It is not overly long, but requires players to hit every shot with purpose. "It not only challenges you physically, but it challenges you mentally," Says Steve Stricker. "It’s like a major. There’s no letup on any hole. On every single shot, you have to be committed." Antigua, Guatemala- Dye Designs is proud to announce the official opening of Fuego Maya at La Reunion resort, the latest new design in the Dye Golf portfolio. Pete and Perry Dye have officially put golf in Guatemala on the map. 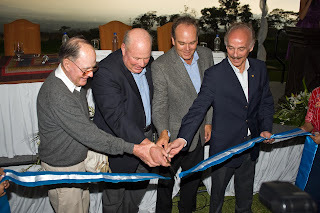 On March 28th, at the official ribbon cutting ceremony, Vice President Dr. Rafael Espada, and the country’s director of tourism, Roberto Robles, recognized both Pete and Perry for their great contribution to development and tourism in Guatemala through the game of golf. "The course looks amazing, and is in wonderful shape," said Pete upon his arrival at Fuego Maya. "Both Perry and the superintendent have done a fantastic job. We are thrilled to see how many jobs we have brought to Antigua because of this project, and we can't wait to work in Guatemala again." 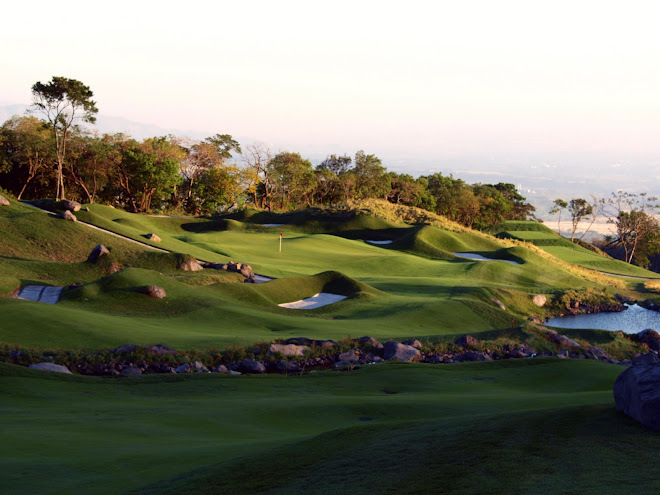 Flanked by four volcanoes, Fuego Maya golf course is a challenging layout with views that are unparalleled. On a clear day, golfers can see 50 miles to the Pacific Ocean. Fuego, the most prominent volcano, can often be seen smoking witch only adds the mystical effect of the area. Guatemala is a country rich with Mayan culture and heritage, which is reflected in the design and appointments of the fantastic 50,000 square foot clubhouse and 25-room hotel on the property. The staff is friendly and welcoming, always making La Reunion feel like a second home for visitors. "Our main contribution to Guatemala is that of creating jobs, and in doing so, our focus is on training and giving support to the personnel hired with the view to developing a highly qualified staff to service discriminating customers from around the world," Roberto Roesch, developer said. "We are also fostering a sense of social responsibility, and La Reunion is playing a very important role in contributing to improve the life of the local population." Pound Ridge a Dye Success Story! Pound Ridge Golf Club is legendary golf course architects Pete and Perry Dye’s first design project in New York. Situated in affluent Westchester County, with such prestigious golf neighbors as Winged Foot Golf Club, Westchester Country Club and Stanwich, the new Pound Ridge Golf Club has been carved out of 172 acres of magnificent rocky cliffs, streams and wooded hills. According to Pete, Pound Ridge is one of his best course designs. 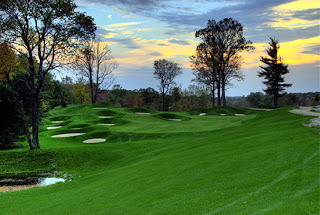 Pound Ridge Golf Club, an 18-hole daily fee public golf course that plays to a par 72 and measures 7,171 yards from the back tees, is a spellbinding layout that winds its way through hardwood forest and opens to rolling meadows. The dramatic rock outcroppings are truly unique and a stirring visual feature of the design. Fourteen thousand feet of rock walls surround trees, wetlands and water hazards. The course’s five sets of tees are classified by handicap ability, allowing players of all caliber to best enjoy the strategic layout and wide variety of shot-making situations. A generous practice area is also available to golfers. The Club plans on building an attractive modern clubhouse in the near future. I am an avid golfer and work in the golf industry. I am passionate about getting women into the game!